According to the main watchdog institutions dealing with media freedom, Slovenia's records are positive. Freedom house places the country among the 62 - over the 197 scrutinized – which are considered as “free” with regard to the Press freedom ranking. Yet, during the last months, Slovenia was not immune from critics, coming also by Dunja Mijatović, Freedom of the Media representative for the OSCE. Mijatović expressed her concern regarding a recent case involving the journalist Anuška Delić, who is being prosecuted for revealing the content of allegedly classified documents. The case appears to be particularly problematic because of its political background, as it involves relations between the neo-nazi formation Blood and Honor and the political party of the former Prime minister Janez Janša, the SDS. This is possibly one instance of the criminal code being misemployed for preventing journalists from covering specific topics, ultimately fostering self-censorship. OBC asked Professor Milosavljević to discuss the overall conditions of Slovenian media. Which are the main features of the media landscape in Slovenia? First of all, the limited size of the internal market and the reduced circulation of the Slovenian language hamper the economic potential of local media enterprises. Unlike other small European countries such as Austria or Ireland, for Slovenia there is no other space where editorial products may be exported. Even if you have a good, quality product, it is difficult to enter the market and be successful in Slovenia. 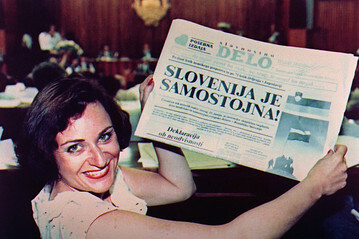 Figures regarding the penetration of newspapers and magazines show these are frequently higher in Slovenia than in many other well-performing European countries. Despite this, the total number (circulation) is much smaller here, ultimately posing a big challenge for media companies. A second relevant aspect has to do with the pluralization of media: such a small market gets very easily saturated. Slovenian market is big enough only for a few big media and a limited number of specialized ones (women magazines, family magazines...) There is no economic incentive for smaller media. In order to be able to survive, these would need financial support, be it private or public. As far as the support coming from the private sector is concerned, in Slovenia this is still very scarce. Slovenian millionaires are not aware of the importance of the media, so none of them wants to support this sector. On the other hand, foreign donors are not interested in Slovenia because it is part of the EU, which leads them to assume that the country should be dealing quite fine compared with our neighbors. In this context, a lot of influence is still exerted by the State. This can be done in particular through state-owned companies like Telekom and Petrol and the like, because they are the biggest advertisers. Media companies with a critical approach towards the government would not receive advertisement funds from state-owned companies. This is a very effective mechanism of economic blackmailing. How can small media survive and keep up with their activities? Officially in Slovenia there are 1,500 different media outlets. This number includes all sort of websites, local and national newspapers and so on. Yet, many of these are really small media companies which do not contribute to the overall quality of the media. What they usually practice is a "copy-paste journalism", based on press release and agency news. Paradoxically, the bigger the number of these media companies, the lower the overall quality of journalism in the country. They are really pushing the quality down, triggering what could be defined a “pauperization process”. For example, at a certain point you had 100 radio stations in Slovenia: it is unlikely that such a big number would correspond to a decent quality level. Concerning media freedom, are Slovenian journalists threatened or under pressure in the country? Compared to the situation of other former Yugoslav countries, Slovenia is dealing quite fine. Physical violence against journalists and editors is not part of the game; keeping this in mind, the situation can be said to be good compared to Serbia, Montenegro or Macedonia. This is also one of the reasons why foreign donors are not interested in Slovenia: the picture in other neighboring countries provokes much more concern. The sort of pressure to which journalists are subject in Slovenia is more difficult to be singled out. However, if you compare the situation to that of the Central European countries, a number of expectations have not been fulfilled and led to disappointments. With regard to public broadcasting for example, transparency and independency have been at stake for the last years, and are now far from attained. Regarding private media, many cases have been reported in which the owners of a given media company were setting their own editorial agenda; this goes together with placing editors under the direct influence of the managers. The result is a more or less subtle censorship, very often ending up in self-censorship. The methods through which this is done are difficult to unveil. Although we do not have so many physical attacks against journalists, other forms of pressure, such as phone calls and emails, can be very effective. Especially in small places, it is hard for local journalists to report about links between local politicians and corruption. What is the situation of media property concentration? The main problem with media ownership in Slovenia is the absence of strategic ownership. For most of the owners, media are simply an instrument to make quick money. All the profit is taken out of the company, it is not reinvested to improve the quality of editorial products. Back in the '90s, newspapers in Slovenia used to be very profitable. They had a lot of subscribers. A smart owner could have been easily successful by simply investing strategically. What happened instead is that they grabbed what they could, to get as much profit as soon as possible without investing anything. How much is this related to the privatization process? Very much. Slovenian tycoons, like the Russian ones, did not really invest their money to acquire those companies. They were managers, and got to own the companies through the procedure of managerial bailout. They would get loans from banks, and in this way they would buy the companies they were running. Very rarely has any of them put any real money into that, they just got into the company at the right time, and then they were able to privatize the company with the help of some political friends and financial favor. This explains also why so many companies are in such bad financial conditions, because of the many loans to repay. Which would be the most urgent measures to implement to avoid further deterioration of the situation? The law should prevent media take over, unless it is financed by sound money. Any take over through loans and the like should be prohibited. That would be the most urgent thing to do right now, otherwise any future takeover would end up in a disaster. More involvement by the international community would be desirable, too. Slovenia is a member of the EU, and the problems of a member state ultimately have an impact on the EU at large. Stronger media could have a crucial role in fostering transparency and prevent many corruption cases. I am convinced that it is a long term interest of the EU to promote better media. It is not a matter of quantity: we do not need more media; on the contrary, we would actually need less media but with better financing of investigative journalism. Good media will not be financed by our local tycoons. This is why a serious effort by the EU is required. Money is not going to come from the private sector. But, who will help to prevent the next crisis, if not the media with its investigative reporting and watchdog role which includes both government and business?